There are tremendous forces of darkness striking the world right now, inflicting unspeakable pain upon humanity. There is also a subtle but deeply profound truth in how this darkness is being awakened. There is a difference in the way that ISIS propagates its darkness when compared to the way previous terrorist organizations built their terror networks throughout history. What is fascinating and frightening about ISIS is that they are allowing the ideology—or consciousness—of their darkness to spread by itself so that people can self-radicalize using their do-it-yourself terrorist kit.This is stunning. This seems to be what happened in the unspeakable and unfathomable mass murder of innocents in the gay nightclub Pulse. The degree of intolerance towards other human beings, specifically the LGBT community, is beyond words. The Bible teaches Love Thy Neighbor. It does not teach Love Thy Straight Neighbor. The dark power of ISIS consciousness-ideology has the ability to transform an individual into a suicide bomber and heartless, gutless and soul-less mass murderer. This demonstrates the power of an idea, a thought, a wave of consciousness to influence and transform a human being. Make no mistake, it has always been ideology that has ultimately influenced and transformed people—for better or for worse—motivating their particular behavioral actions. But now it is becoming more clear than ever before. This is absolutely not surprising to the Kabbalist. The Kabbalist and the ancient Zohar tell us that consciousness is the force that brought our universe into existence, and consciousness permeates and lies at the very fundamental substance of reality. Science is finally beginning to say the same thing. We are made of consciousness. Therefore, other forms of consciousness (ideologies) automatically influence us. There are different streams of consciousness in our world by design. Developing and mastering the various levels of consciousness is part of the process of evolving ourselves as humans beings through the gift of free will. For instance, there exists at one end of the spectrum (the highest level) the Divine consciousness of sharing and loving others unconditionally. At the other end of the spectrum (the lowest level) there exists the negative consciousness of insatiable receiving (ego) at the total expense of another human being, which is what gives birth to pure hatred and evil. And there are countless levels in between.When the negative consciousness is free to run amok, and is out-of-control, it leads to mass slaughter in a night club and genocide in a nation and other dark, unspeakable acts caused by a vile form of thought consciousness motivated by unbridled selfishness. It just so happens that the Zohar and its wisdom and ideology work that exact same way as the ISIS ideology and the phenomenon of self-radicalization that is currently terrorizing our world. The Zohar also transforms consciousness by virtue of its teachings and Light.The difference is, the Zohar is the opposite and the antithesis of the ISIS stream of consciousness. The Zohar, and all that it embodies, is the antidote to the darkness in this world. We will aways have the free will to choose which consciousness we seek to embrace—Light or Dark or somewhere in between. This is how we battle and earn the ability to possess the ultimate divine consciousness within us so that we can create a world of paradise simply through our thoughts and dreams and desires. The concept of a jihadist is deeply and unquestionably true. We are all here to wage a holy war. Except, that holy war is supposed to be an internal war, a war waged on the human ego, the reactive, narcissistic, fear-fueled consciousness that rules over our lives and is found inside each one of us. The true battlefield is our field of consciousness, the human mind. The problem is, there is another form of consciousness that deceives us. That consciousness is the ego, which makes us take the Bible, The Koran, the Torah and all biblical wisdom literally. When we do that, we get the opposite of truth. This is why the Zohar says those people who take the Bible literally, it would be better if such a person had never been born. That’s how dangerous and misguided it is. All the enemies and battles that take place in the Bible are really discussing a war against our own, internal negative consciousness. It’s a war against the ideology of the human ego, which tries to make everyone in this world my potential enemy and competitor, instead of my teammate and a limb of my soul. The Bible is a code. Period. As we unravel that code, which is what Kabbalah and Zohar are all about, we not only become wiser in the true wisdom of humanity, but more important, that wisdom, that ideology, transforms our nature from taking to giving, from receiving to sharing, from intolerance to tolerance, from human indignity to respect and dignity towards others unconditionally, regardless of race, religion, gender, and sexual orientation. Love Thy Neighbor. Period. That is the end goal and path to ending all darkness. In other words, this wisdom purifies, the same way ISIS ideology radicalizes. It helps achieve the end game, which is the end of darkness and death. A negative person consumed by selfishness and depression and fear can be tipped to the side of extreme darkness when exposed to a negative power of consciousness like the dark, warped ideology propagated by ISIS. They will then become self-radicalized. Likewise, a person hovering on the edge of Light and Darkness will be compelled to the side of Light when exposed to the ideology and divine Light consciousness of the Zohar. They will become self-actualized, revealing their true inner divine core and soul. When students of Kabbalah live the principles of Zohar, they are influencing people and the entire world. They are helping to tip civilization to the side of positivity and Light. Each time we battle our own ego, we strike a blow against the global forces of judgment and darkness. When we allow our ego to experience tremendous pain for the sake of treating others with dignity, that effort and influence ripples across the globe. 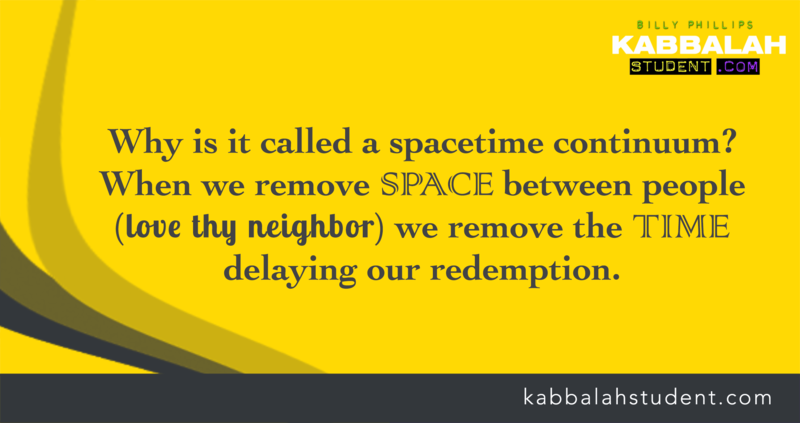 When we share the Zohar, we are also influencing the people around us and the world at large. And make no mistake, the same way two subatomic particles can influence each other instantly, “faster” than the speed of light, even if they are a million miles apart, our simple actions of reigning in our ego and treating others with dignity affects the entire population, instantly, all over the world. Only the ego blinds us to this stunning truth. The same way a person can self-radicalize by reading about ISIS ideology, a person can also self-actualize the Light of their soul, and the love dwelling deep inside of them, by being exposed to the Zohar and people who live the wisdom of Zohar. This was never more evident than during the last great period of judgment known as World War ll when over fifty million people were killed. During the Holocaust, there were Sephardic Israelites living in Morocco who scanned Zohar 24 hours a day, in relay teams, to draw down a blanket of protection. If you watch the video below, you will see how the Light of Zohar can protect a human being despite the vile presence of extreme darkness and genocide.We must share the Zohar with our fellow-man in order to mercifully and gently diminish darkness and do away with it once and for all.We must find our own ugly traits and struggle to transform them, and we must share the Zohar with others because both actions will help bring protection to the rest of the world. We have the responsibility to become a Light unto all the nations. We do it through our own interactions with our friends, family and foes. Dignity. For everyone. Especially when it shatters my own opinions and ego. The video below will offer you just one example of the profound miracle that Zohar can offer us and why it’s imperative to bring this Light to all nations.Only our ego will try to save itself by igniting doubt, cynicism and skepticism that will prevent us from realizing that consciousness affects people and that the Zohar’s consciousness and ideology brings forth the miracle of protection and a desire to treat others with human dignity. Very interesting! Loved the video slideshow.